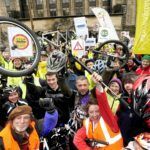 Scotland’s biggest civil society coalition says a new hard-hitting UN report shows that the country needs to take further action to fulfil the promise of its Climate Change Act. Stop Climate Chaos Scotland was reacting to a report published by the UN’s Intergovernmental Panel on Climate Change (IPCC). The report shows that global emissions of greenhouse gases have risen to unprecedented levels despite a growing number of policies to reduce climate change. Emissions grew more quickly between 2000 and 2010 than in each of the three previous decades. The report says Governments need to do more to promote renewable energy, and to make sure that energy is used efficiently. Tom Ballantine, Chair of Stop Climate Chaos, said: “Previous reports from the IPCC have highlighted the massive risks we are taking with people and the planet. “This report tells us what nations across the world must, and can do. It is possible to avoid the worst impacts of climate change but we must drastically reduce emissions, starting right now. “The longer we wait, the more it will cost, not just in terms of money, but in terms of the massive impact it will have on people and environments around the globe. “The report underlines the need to reduce our reliance on fossil fuels and instead focus on green energy.